Remedies for colic help moms and babies around the world go through the period of colic. Dealing with a colicky baby can be an exhausting and frustrating experience. It is, however, important to remember that it is temporary and isn't anyone’s fault. Colic just happens. Through colicky crying and fussing the baby is expressing his/her emotions, communicating with you. Visit Colic In Infants section to read more about causes and symptoms of colic. In this section I collected all the known to me remedies for colic that mothers use to help their babies. It includes a couple of my favorite non-traditional remedies for colic. Colicky babies, in general, respond better to homeopathic cures. I do not recommend giving your baby anything medicated. Colic is NOT a disease; it is your baby’s way of adjusting to the outside world. First of all and before trying any remedies for colic, you need to talk to your baby’s pediatrician to make sure there are no medical reasons why your baby cries. Bring your baby for a visit if needed. Do not simply blame excessive nonstop crying and baby screams on colic. Visit Crying Babies section to read more. If you suspect your baby is gassy, massage his/her tummy moving your hand clockwise. Try putting your baby on your lap with his/her tummy down and stay like that for some time. Try applying warm compress to his/her tummy. Hold your baby upright so that his/her naked tummy touches your skin. It provides warmth and comfort. When my son was gassy, my husband was laying him down on the bed and pushing his legs up towards his chin. It worked magic in releasing trapped wind. Do it rhythmically, take breaks. Be gentle and make sure the surface is soft so that not to hurt baby’s back. Watch your baby nurse. Does it seem like he/she is swallowing too much air? If your baby is extremely hungry, excited or your milk is pouring out vigorously, this may cause gassiness. Express some milk before feeding to make breasts less full. Try nursing your baby when he/she just woke up and isn’t that excited and hungry yet. Also try holding your baby in a vertical position when nursing. Visit Oversupply section for tips on how to handle it. Eliminate dairy and other foods that a baby’s stomach may be sensitive to. You can find a list of foods here. If formula-fed, try switching to a hypoallergenic formula. I personally recommend Nutramigen by Enfamil. Probiotics is one of the most popular remedies for colic. Ask your doctor for brand recommendation. If your baby is sensitive or allergic to dairy, make sure you pick the non-dairy probiotics. I recommend dairy-free organic Raw Probiotics for Kids (by Garden of Life). Hold, carry and stay with your baby. Colic time is not the time to discipline him/her by leaving crying in the crib or teaching them to cry themselves to sleep. Colicky babies need your care, attention and reassurance that they are needed and loved as never before. Motion is one of the best remedies for colic. Rocking, walking, swinging, dancing softly or sitting in a rocking chair, putting your baby in a stroller and going for a walk, or putting him/her in the car seat and going for a ride provide colic relief. Placing your baby in a sling and carrying him/her around may also sooth the baby. Your smell, heartbeat and physical closeness are magic for your little one. The movements shouldn’t be fast – it will tire you up and stimulate the baby even more. One movement per second – nice and rhythmical. Many babies love being swaddled. Most former Soviet countries' parents swaddle their babies all the time, but especially for the night time. It gives the baby the sense of protection, security, and comfort and prevents them from waking themselves up. It also works for many colicky babies. La Leche League Leaders Diane Wiessinger, Diana West and Teresa Pitman mention another colic relief in their book “The Womanly Art of Breastfeeding” – the colic hold. Here is how to do it: turn your baby with his/her back towards you horizontally with the head to your left. Place your left arm under your baby across his body: from his/her left shoulder towards the right thigh. So both baby’s arms will be on either side of your arm. The head will be turned right and the left cheek will be resting on your arm. You can also add rocking to it. This is a great hold indeed. You can keep your baby close, warm up his/her tummy with your hand and arm and still have one free hand. Remember: Do not ever shake your baby! It may cause severe brain injury. Stay calm yourself for two reasons. First, your baby is reading your emotions and feeding on them. Stressed mothers have stressed babies. Second, if you let yourself lose it, you may end up shaking the baby. And this is a no-no! Different sounds have different effect on different babies. Try soft gentle music. Or the recording of soft nature sounds: birds singing, water splashing, wind blowing, and heart beating. On the other hand, some babies react the best to louder sounds, the so-called white noise. It is basically any equal-frequencies noises, like fan, vacuum cleaner, radio static, white noise machine. This is not surprising. White noise has long been used in helping people who have difficulty falling asleep. Take caution not to scare your baby. It is best to hold him/her and make the sound not too loud. Russian educationist Olga Eremeeva suggests one of the most interesting remedies for colic. When a baby starts reacting to bright light, he/she also discovers bright colors. She calls this time “orange period” - when the baby is attracted to bright colors. According to Eremeeva, a baby will stop crying if you wave a red or an orange fabric in front of him/her. I read about this trick recently and didn’t have a chance to test it, but when you try it, please share your experience in the comments section at the bottom of the article, so that other moms could see it too! More often nursing is one of the most effective remedies for colic. Don’t be watching the clock and feeding on schedule. During colicky periods breastfeed as much as your baby wants. It will give you some rest as well. Also, try feeding your baby more often. This way he/she will learn to eat less, but more often, and smaller portions are easier to digest. Smoke and tobacco-burning by-products can be another cause of colic. Visit Smoking section to read more. Give your baby a bath. In fact, you can take a bath together. Add lavender or chamomile into the water. You can either put some dried lavender or chamomile into hot water, cover the container and let it sit for 10-15 minutes, or put 2-3 drops of lavender or chamomile oil into the bathtub. These two herbs are great for soothing. Remember: Chamomile dries skin. Your baby will likely need some lotion after a chamomile bath. Another way of using them is soaking a towel in warm water with 2-3 drops of lavender or chamomile oil and then applying to baby’s tummy. 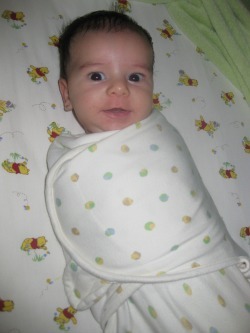 Swaddle your baby in something warm, because the towel cools down soon. Another method is a home-made analog of gripe water. I am not a fan of store-sold gripe water, as it has several additives to make it stay good for a long time. It may also contain alcohol. Instead, I used to prepare my own fennel/dill water at home. 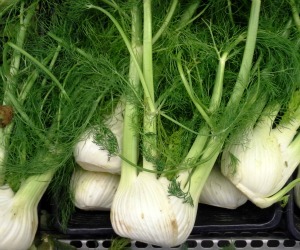 Fennel and dill are known for their soothing and gas-relieving qualities. I think fennel is more effective. Both waters are made from seeds of fennel or dill. They both are used as spices, so not at all hard to find. I found mine in an organic produce store. Fennel seeds should not be confused with anise. They both have a very similar taste, so they are used interchangeably in cooking. But to make fennel water you need fennel, not anise! If you find fresh seeds (some people grow them), it is even better. I used dried seeds, so I soaked a teaspoon of them in cool water for an hour to soften them. Pour the water out and put softened seeds into a glass of hot water, cover and let it sit for 30-50 minutes. The water will smell like cooked dill and will change color to slightly yellowish. You may give your baby a teaspoon of this water up to 4 times a day. This water expires fast. You need to make fresh every day. 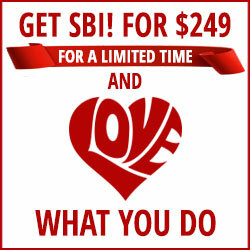 This is what makes it different from its commercial alternative. It is natural! I always made a little more and had some myself too. It is calming and soothing. These remedies for colic are gentle and natural. Therefore, you may hear that they don’t always work. It is true, they may not work for you, but they definitely won’t harm you. Try and see for yourself. Hopefully one of my favorite remedies for colic will become your favorite too! If everything fails, you will need to learn to live through colic. Always remind yourself that this is temporary. Take naps. A calm and rested mother handles crying baby much better. If it becomes unbearable, find a way to get out and away from your baby. A couple of hours of solitude is often all it takes to regain strength and refill energy.